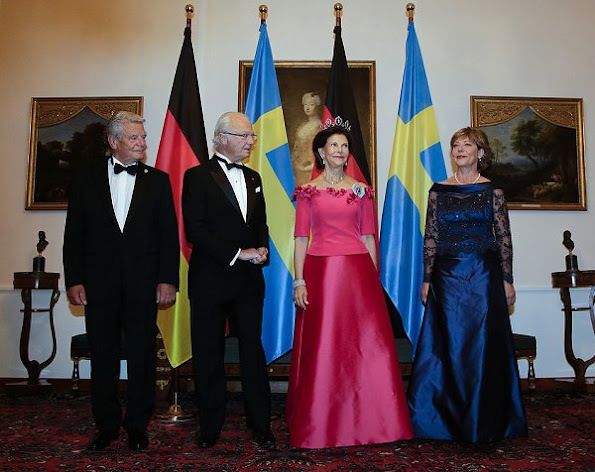 Queen Silvia and King Carl XVI Gustaf of Sweden attended an official dinner held by the German President Joachim Gauck and his partner Daniela Schadt at the Schloss Bellevue palace on October 5, 2016 in Berlin, Germany. 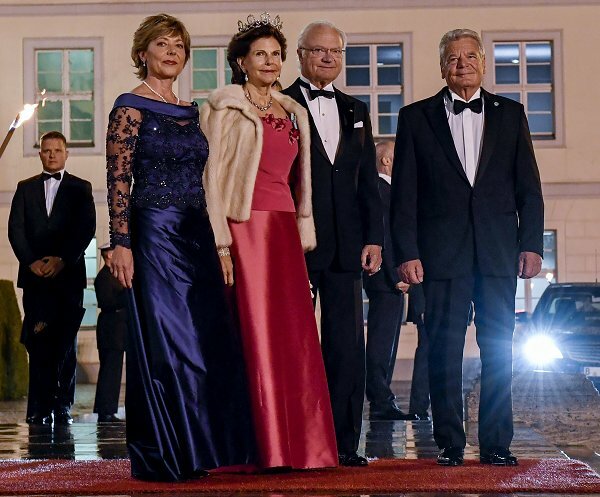 King Carl Gustaf and Queen Silvia are visiting the country on a four-day trip. That is a lot of shiny fabric! Also, this week gave so many royal photos with tiny funny details. Look at the second with the ladies alone! Daniela: My dress is shinyer! Silvia: Oh dear. But it's all wrinkles. And I have a tiara. Double WOW! She is bringing it! Nice pop of color! She was absolutely a beautiful woman. I think she was very pretty. Everything I have ever read speaks of her beauty. Haha in real life she was one of the most beautiful women in the world. 1975 I bought a doll in London wich looked exactly like Silvia in 1976! But now something has happened with her collarbone. In her youth Queen Sylvia was a true beauty, who looked like a sister of actress Ally McGraw. Now she's is a 72 years old lady who has kept a wonderful figure and has managed to perform with grace and dignity her role as queen of a country foreign to her before her marriage, and that has surely not always been easy. It will perhaps come as a surprise to you, but you also grow older with each passing year and sooner that you might imagine someone will be making disparaging comments about your looks. Yes Sakurahime she looked just like Ali McGraw! Gorgeous dark haired beauty! I just don't see how anyone can say Silvia was not pretty 😞😨 as she was a beauty then and remains very elegant and I think very pretty STILL. Silvia has a grace and dignity that increases with age. She is a very beautiful woman by any standards. "never a beautiful woman" -- obviously you have not seen photos & films of Sylvia in her youth. Look at Google Images. She was just beautiful and still is -- inside and out. 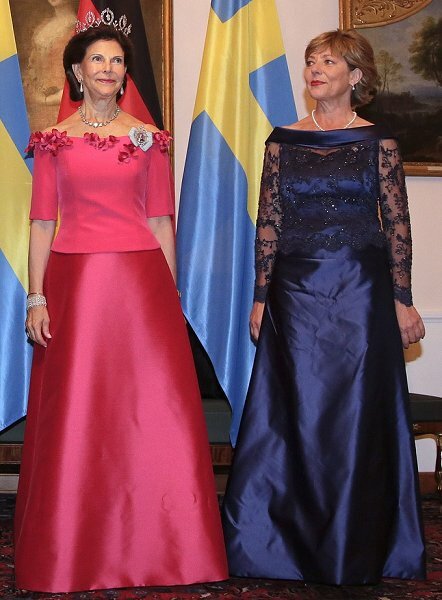 Queen Silvia looks lovely and elegant. Love her dress and the tiara - WOW. Stunning dresses worn by both ladies! She never was one of THE MOST BEAUTIFUL women but she was good looking, pretty , attractive woman and I suppose it is still something nice in her looks considering her age.